Red Dead Redemption 2 is a landmark technical achievement – and the end result of a unique development situation. With Grand Theft Auto 5, Rockstar has already developed the top-grossing title in the history of the games industry – and with that comes the confidence to invest all of the time, money and resources required to realise its vision for the ultimate game. The final product is technological masterpiece, matching and arguably exceeding the very best first-party efforts of this generation. And that’s another key point that makes Red Dead Redemption 2 so fascinating. Grand Theft Auto 5 on PC, PS4 and Xbox One features myriad improvements over the original PS3/Xbox 360 releases, but fundamentally they are still titles with last-gen roots. Rockstar’s new game is obviously built with the current-generation platforms in mind, sharing with and building on many of the technical advances seen across the industry in recent years. That said, it’s also a game that feels decidedly different from other open world titles released this generation – almost as if it were built in isolation, and the team has focused on visual flourishes that you might not expect to see in such a game. In essence then, what we’re looking at is a newly evolved iteration of Rockstar’s RAGE engine. There are many familiar elements here, but the developer has taken this opportunity to push its technical and presentation skills to a new level. And what’s equally impressive is that the studio has managed to deliver this at full native 4K on Xbox One X – but resolution is only one aspect of image quality. For starters, a proper temporal anti-aliasing has been implemented – with the long draw distances and lots of gritty detail on display, this is a must when it comes to reducing shimmering and giving a more temporally stable, filmic image. The TAA solution here is aggressive and does result in a softer overall look but the results are more cohesive, with everything from open fields of grass to fine texture detail and even beards blending nicely into the overall presentation. Red Dead 2 also features per-object motion blur for perhaps the first time in Rockstar history – it’s a subtle effect but one that increases the sense of fluidity lacking in other open world games such as Assassin’s Creed Odyssey and The Witcher 3. But these are just basics aspects of image quality – the lens through which the game is viewed – and it’s the world itself that is this game’s defining achievement. In building any open world, a development team faces many challenges when it comes to creating something that is both visually attractive and highly playable. From our perspective, the best open worlds offer a mix between a large sense of scale with vast swathes of terrain stretching out into the distance combined with a high volume of granular, close-range detail and a rich simulation. A world such as this is composed of many pieces – open terrain, dense forests, packed cities, tall mountains and vast skies. Our detailed video breakdown of Rockstar’s latest magnum opus. Rockstar has actually spent a lot of time – and presumably GPU resources – in creating Red Dead Redemption 2’s immense skies, which play a huge part in building atmosphere and defining the landscape. In the past few years, developers have made advances in sky rendering, moving away from flat billboards and textures and developing more volumetric solutions. Red Dead 2’s cloud rendering system supports full time of day changes plus variable weather and cloud types, with sunlight realistically penetrating and scattering through the soft cloud bodies. When it rains or snows, light penetration is suitably reduced, simulating darker, thicker clouds that occur alongside inclement weather. In the right conditions, even rainbows can manifest across the environment. With little information available on how this system has been implemented, however, we can only hypothesise how this was achieved. Based on our observations, we’re looking at a solution much like Horizon Zero Dawn, which basically involves ray marching through variable 2D and 3D noise textures. Guerrilla Games keeps the rendering cost low by updating clouds every 16 frames and reconstructing from this data and it seems like that a similar method is employed here. Clouds crawl smoothly across the sky in this game with minimal artefacts, even when simply observing their movement in real-time. There’s a greater variation to possible cloud formations as well, lending the game a greater sense of variety across its vast skies. What I really like most about Rockstar’s implementation, however, is how incoming storms are handled – the sky gradually darkens as the wind simulation becomes stronger while the surface below exhibits an eerie glow. It’s a remarkably evocative look. It’s a remarkable leap over Grand Theft Auto 5, where the clouds are derived from a Perlin noise pattern mapped over a large dome which encircles the game world. This enables wide variation in cloud patterns, but it lacks the three-dimensionality you get with the volumetric system in Red Dead 2 – the clouds simply move along the surface of the virtual dome. It works just fine in real-time and its limitations are only really exposed in time-lapse, but Red Dead 2’s implementation is our first example of a true generational leap in the open world’s make-up. And this is just the beginning. Light from the sky naturally casts shadows and these are of a quality rarely seen in a console open world game. Similar to GTA5, cascaded shadow maps appear to be utilised, but Rockstar has developed a clever new solution to simulate contact hardening. It’s a remarkable, computationally expensive way to create a more accurate effect, with shadows near the object presenting more sharply, gradually becoming more diffuse the further away they are. It’s all tied into the position of the sun and the length of the shadows – and being an open world title with a full time of day cycle, everything is generated dynamically in real-time. Not only that, but shadow rendering is also impacted by cloud cover too. Boiled down to the basics, it’s a matter of drawing direct or indirect shadows – when in direct sunlight, the shadow penumbra is well defined while an overcast day produces more diffuse shadows instead – a nice touch. It suggests that both types of shadows are rendered concurrently – perhaps the game can combine the two to enable the appearance of contact hardened shadows and more diffuse shadows within indirect lighting. Either way, shadow maps are always sampled with a dither pattern designed to smooth out edges, while distant diffuse shadows often make use of a bokeh-like pattern to simulate light dispersal. All of this is to say that the team has clearly paid very close attention to how shadows behave in this type of environment and have found creative methods for simulating this behaviour. It’s an attention to detail we’ve rarely seen in a console game, let alone one with an open world of this complexity. All of this is enhanced by a robust set of atmospheric effects that play a huge role in defining the visual style of Red Dead 2 – this includes local fog volumes, volumetric light shafts plus water reflection and refraction. During the day, fog volumes are used to greatly boost atmosphere with light seemingly scattering through the air in a realistic manner. The placement and intensity vary heavily based on weather conditions and location on the map, but the effect is highly convincing – there is a real sense of thickness to the air where appropriate. At night, smaller local fog volumes are used to create a rather hazy atmosphere with dynamic lights illuminating the way. If we had to guess, Rockstar is using camera frustum aligned 3D textures: the idea is that artists can use this feature to place individual froxel volumes where needed. The way sunlight can interact with these volumes and produce beautiful crepuscular rays is especially impressive at dusk or dawn, where sunlight slices across the scenery in dramatic fashion. There are so many potential use-cases here and Rockstar uses this technology intensely throughout the game, lending the world a sense of depth beyond any previous of its previous productions. Water plays a role in defining the world as well and there are a variety of techniques used here to achieve some impressive results. Firstly, water reflections are handled using a mix of screen-space reflections and a lower resolution reflection texture, generated from select bits of scenery. The world features a mix of rivers and larger bodies with variable roughness, so reflections exhibit variable definition. It works well but the SSR elements exhibit the typical artefacts along the edge of the screen – a limitation of the technique. And of course, if an object isn’t display on-screen, it won’t be reflected at all. A refraction map is also generated – this is responsible for water caustics and the colour of below the water surface. Then there’s the building blocks used to create the environment itself. Rockstar is known for creating large, memorable worlds and Red Dead 2 is no exception. With the additional memory included in modern consoles, the developer can increase the amount of model and texture variety beyond previous games. One of the most important elements to get right with a game like this is the sense of scale. Red Dead 2 features many wide-open fields which stretch far off into the distance. For this to work in a convincing manner, LOD management is critical. The original Red Dead managed to make this work by centering on a dusty, dry valley with limited foliage. Red Dead 2 takes place in a far more fertile region, however, which increases the challenge inherent in defeating object pop-in. The game appears to work similarly to previous RAGE titles – basically, it’s all about managing the transition between distant and near field details. This is done using lower polygon meshes for distant areas of the world while loading higher detail assets as the player approaches. If you look carefully into the distance, you can see the point where the game transitions between these various levels, but it appears that the artists have poured a lot of time and effort into building something that appears nearly seamless during traversal. LOD pop-in is really difficult to eliminate completely, but the cohesiveness in rendering Red Dead 2’s open world is a key aspect of how immersive it is. Streaming and memory management is always tricky and Rockstar has managed to minimise or eliminate performance spikes typically associated with this. There’s little to no hitching during high-speed traversal – and there’s never a sense that the game is struggling to draw the world around you. The design of the environment is also fascinating. Rockstar has built the world with lots of visible landmarks designed to ease navigation. You can follow train tracks to locate various towns or simply walk along the coastline. The design of the vistas is very deliberate and after a couple of hours, I could navigate the world smoothly without relying on the map at all. Even better, you can toggle the mini-map at any time by holding down on the d-pad and pressing the associated face button. This is a fantastic addition that eliminates the need to bring up an options menu when adjusting your HUD options. Perhaps it’s easy to hand-wave this aspect away, but it’s clear that a lot of time and effort was poured into very carefully thinking about world design. This is very important for immersion and traversal: a good world should feel open yet easy to learn and Red Dead 2 succeeds in this area. Of course, the game’s signature epic vistas are just one element in selling realism and immersion; near-field detail is equally important, if not more so. Red Dead 2 marks Rockstar’s first full foray into physically-based rendering, which has become increasingly popular this generation. PBR, of course, seeks to more accurately simulate the interaction of light across material surfaces taking things such as surface roughness and reflectivity into account. As Red Dead takes place in the late 1800s, modern shiny materials are relatively uncommon, so the shift to PBR enables a subtle realism that greatly enhances the presentation. This is especially evident when exploring areas such as Saint Denis – the game’s stunning representation of New Orleans. This booming port town is rich in stone, wood and metal and the juxtaposition of these materials leads to suitably realistic results. The combination of PBR materials with the pre-calculated global illumination technique and fog volumes helps to build a very cohesive image that often looking stunning. While the bright sunny days are certainly beautiful, it’s darker scenes that are often more striking. The indirect lighting is simply beautiful, and the team manages to simulate the appearance of natural light bouncing across the scene. This is perhaps the greatest improvement over GTA5 – its origins as a PS3/360 title are evident in how it handles its materials, which are not physically-based, while the lighting system is nowhere near as robust. There are also a lot of geometrically dense structures placed across the environment, especially in towns. Building facades exhibit an impressive amount of detail with high-resolution textures, rounded arches and carefully carved edges. This is complemented by copious volumes of self-shadowed parallax occlusion maps. Red Dead uses this technique for a wide variety of surfaces including stone work, patches of mud and dirt, brick walls used in building construction and even roof shingles. One of the best examples of this technology in action would be the train tracks – the gravel uses POM, of course, but so do the wooden planks on which the track rails are affixed. So rather than rendering a bunch of geometry here, it’s just a texture which should save on rendering resources. Outside the city environments, foliage is used in large volume. Trees, bushes and grass are placed liberally across the landscape. The core assets themselves are of high resolution and there appears to be a large number of bespoke assets, solving a potential issue with repeating patterns in large fields or forests. Ambient shadowing is realistic and subtle across plant life, while light penetrates leaves and grass realistically, and the density feels just right. Moving into a dense forest, there’s a wide variety of tree assets placed throughout which when combined with the local fog volumes, really boost the game’s atmosphere. Plants and branches also feature bend points which collide with character models, giving the impression of foliage reacting to the player as you explore. The snow makes for an interesting GTA5 comparison, since both games begin with snowy sequences. The introduction of deformation and a new materials system greatly increases the realism of Red Dead 2 over its immediate predecessor, appearing more natural and less static. A realistic deformation system similar to that seen in Rise of the Tomb Raider is featured, and it’s applied to both snow and mud. The results trails persist a great distance from the player making it possible to double back on your progress. Look closely and you’ll see that during rainfall, puddles form within the notches and divots in deformed terrain. Red Dead 2’s overall realism is next-level stuff. Just one example is the way in which light penetrates cloth. Go inside a tent and sunlight permeates through, with diffuse foliage shadows cast on the material. Go outside at night and you’ll see the reverse effect: light from your camp lamp inside shines through to the exterior. The subtlety of the way that light interacts with materials can even extend to Arthur’s hat: the top of the hat can cast a shadow which can be seen through the illuminated brim. And this brings us on to another area where a huge of amount of effort has gone into the game: character detail. Red Dead 2 is a story-driven game and includes a vast amount of cutscenes showcasing characters in close-up. Texture detail is relatively high, while hair and beards are nicely modelled and grow over time, requiring your character to shave – unless you prefer a huge beard, of course. Sub-surface scattering is applied to skin in both cutscenes and during gameplay allowing sunlight to penetrate the skin surface and disperse accurately. Clothing is also detailed and varied with realistic textures for leather, fur and cloth. Beyond that, a lot of work has been poured into animation and physics simulation. As you stroll around on foot, your tools and clothing bounce realistically with each step, while animated normal maps are used to simulate cloth folding and twisting as you walk. This same technique is applied to your horse as well – you can see your horse’s muscles contort realistically while galloping. The level of detail is exceptional, so for example, if you stop and take a closer look at your horse, you can even see it breathe. Inverse kinematics are applied to character movement allowing them to properly connect with the ground regardless of incline. If you fall from a high point, your character even rolls realistically down the hill. Animation is consistently excellent across the board, with genuine weight behind every step and punch. Riding across the world on horseback looks just remarkable – greatly exceeding the sometimes awkward animation witnessed in otherwise state-of-the-art games like Assassin’s Creed Odyssey. The horse animation actually reminds me somewhat of the excellent results achieved by Bluepoint in this year’s Shadow of the Colossus remake. The fidelity of the animation holds up across the board, extending to Red Dead Redemption 2’s first-person point of view. This feature was implemented in Grand Theft Auto 5 when ported to current generation platforms and it’s a great addition. Essentially, first-person mode plays somewhat differently with a higher walking speed, an adjustable field of view and lots of well-made first-person animations. It’s a surprisingly immersive way to play the game and it can be enabled at any time by cycling through the different camera options. You can even engage a cinematic camera by holding the back or touchpad buttons briefly. This triggers an ultrawide presentation with shifting cameras that do a decent job of dynamically framing the action, like a movie. 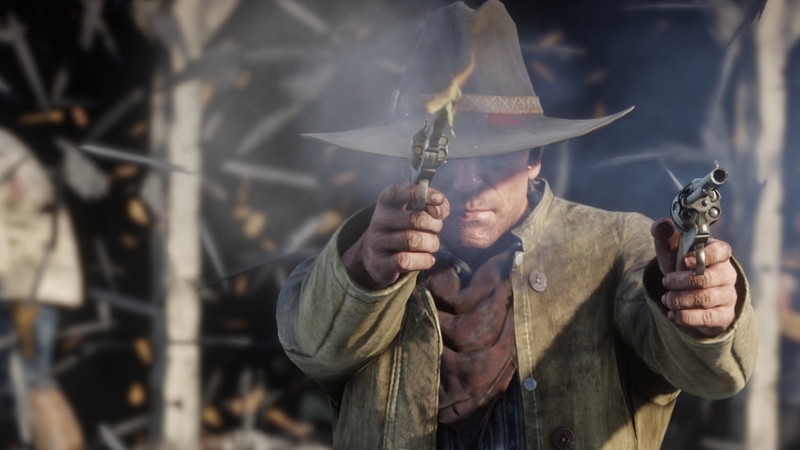 Putting this article together almost comes across as a ‘wow, look at this’ collection of moments but in truth, a single article covering seven years’ worth of work by some of the most talented developers in the business is only ever going to scratch the surface of the overall achievement, particularly when Red Dead 2’s unprecedented level of immersion is built on so many subtle details. The fact is that there have been some truly spectacular looking games released this year alone – Insomniac’s Spider-Man for one – yet there is a level of immersion and cohesion here in Red Dead 2 that really took me by surprise. Rockstar has always excelled in building a beautiful world, and it’s fair to say that the original Red Dead still holds up in this regard, but the sequel really does push things forward, and represents a full generational leap. The chances are that you’ve seen the cinematic and gameplay trailers, but I genuinely think that Rockstar’s promotional materials actually under-sell the quality of the final experience. From a technological standpoint, there’s a lot of breathless praise – but are there any areas where the game falls short? Well, performance variations between platforms is something to be aware of and we’re covering that separately. However, in terms of the common feature set across all systems, I’m not sure HDR is providing much in the way of a tangible benefit, and certainly the calibration system is limited. The majority of our gameplay has been in SDR – principally for video production purposes – so this is something we’ll need to take another look at. But in conclusion, Red Dead Redemption 2 is a game that must be experienced, offering one of the most detailed, immersive open worlds we’ve seen on consoles. In truth, we could spend even more time discussing the amount of effort put into the game’s systems – like the excellent dynamic music score and superb use of surround sound – but I think the point has been made: this is an exceptional achievement, and a one-of-a-kind title on the current console generation.